Following the disaster in Flint, Michigan's water system, cities across the country are taking another look at the safety of the water flowing through aging infrastructure. Chicago is no exception. Like many Midwestern and Eastern Seaboard cities, the Chicago area has thousands of lead pipes bringing water into peoples' homes. Is it time to get them out? Elizabeth Brackett reports. You can read the transcript of her report here. Below, some additional information about the hazards of lead in Chicago water. While none of Chicago’s water mains are lead there are 400,000 lead service lines that lead from the water mains to people’s homes. An EPA study conducted in 2011 and 2012 in Chicago found higher levels of lead in water lines than had previously been reported. This occurs mainly after construction has disrupted the lines. Test your water. Most public water systems will test residents’ drinking water upon request. Chicagoans can call 311 for more information. Be informed of any work that could disturb a home’s lead service line. Work such as a water main replacement, lead service line repair or replacement of the lead service line could disturb the lead service line. Run water before consuming. The Illinois EPA recommends residents run their water before using it if they haven’t used it for several hours. While the EPA does not recommend a specific amount of time (the agency says that is dependent on whether or not the home has a lead service line), the city of Chicago recommends homeowners flush all of their home’s waterspouts for 3 to 5 minutes after an old water main has been replaced. Before flushing, the city recommends residents remove any aerators on their faucets. Use cold water for drinking, cooking and preparing baby formula. Buy lead-free faucets and plumbing components. Remove the entire lead service line. This one comes at a hefty price tag. Removing and replacing a home’s lead service line can cost between $10,000 and $20,000. More detailed information, including how to identify if you have a lead service line, how to clean aerators, and the EPA’s guidelines for flushing water can be found here. NSF International, an independent not-for-profit organization, certifies products for food, water and consumer goods industries to minimize adverse health effects and protect the environment. In response to the water crisis in Flint, Michigan, NSF released a consumer guide to international certified lead-filtration devices. Listed below are the different types of recommended products and how they work (detailed information about products can be found on the NSF website). Faucet mount: Mounts on a kitchen faucet. Uses a diverter to direct water through a filter. Reverse osmosis: Connects to your plumbing under the sink and uses a membrane to reduce lead (also can reduce minerals/total dissolved solids). Elizabeth Brackett: Chicago's drinking water flows through 4,400 miles of water mains buried beneath the city’s streets. Water commissioner Thomas Powers says none of those water mains contain lead. But there are plenty of lead pipes in Chicago's water delivery system. Thomas Powers, Chicago Water commissioner: The lead exists in what we call service lines that run from the water main into the home. And lead also exists in the home – in the fixtures, in some cases in the soder in the copper piping and in some cases in pipes inside the house. Brackett: Chicago didn’t stop using lead service lines to bring water into homes until 1986—the year lead pipes were banned nationwide. EPA water expert Miguel Del Toral says lead was initially used because it is stable and rarely leaks. Miguel Del Toral Miguel Del Toral, EPA water expert: They move when the ground shifts and they don't break, so from an engineering standpoint, if you will, they're a perfect material to use for pipe. Del Toral: But they're not safe for humans. Brackett: Not safe says Del Toral, who was the first EPA employee to raise the alarm about Flint's water crisis, because all lead pipes leach lead into the water, but Powers says Chicago’s water is treated to prevent lead leaching. Powers: We have a very aggressive corrosion-control program here in the city of Chicago. We add a chemical to the water called orthophosphate. Orthophosphate—what it does is, it is a chemical that we add continuously to the water. It is always ever-present in our treated water. And what it does is it coats any metallic surface and inhibits the lead from leaching into the water. Brackett: Still the water commissioner struggles with the question of the safety of lead pipes. Thomas Powers Powers: Are lead pipes safe? No, lead pipes are not safe, and that is why we have this aggressive corrosion-control program. Brackett: With the corrosion-control program, are they safe? Powers: That's a tough question, Elizabeth. By any medical doctor's standards there is no safe level for lead. There are limits set forth by the U.S. EPA on what are defined as actual levels and we consistently are beneath those levels. Brackett: But when Del Toral led a study of Chicago's water system two years ago, he found higher levels of lead than previously reported. The higher lead levels were found most frequently after construction projects had disturbed the lines. Del Toral: When you disturb the line you knock off the protective coating within the service lines that actually prevent the lead from getting into the water. And so that is primarily what we found when we looked at all of the data. The lines that had been physically disturbed—and they can be disturbed in different ways—typically they had the higher lead levels. Brackett: That's a problem in Chicago because Mayor Rahm Emanuel is replacing 900 miles of old water mains over the next decade. Each time a new water main goes in it gets reattached to the service lines into the home. Here on West Roscoe on the North Side, city water management workers are replacing mains for 220 service lines. Residents in the area are told to take action after their service lines are reconnected to the new main. This is the flyer, left, that the city hands out when the project has begun. It tells residents to flush their service lines for 3 to 5 minutes after the new main has been connected to the lead service lines coming into their house. The flyer says the flushing will remove the lead particulates that may have come loose from the property’s water service lines as a result of the project. But Del Toral's study found that after water pipes are disturbed, high lead levels are found for months or longer. He says there are things residents can do. Del Toral: One of the things they could do is temporarily use a water filter. They should also clean off the aerators or if they are using the filters, clean off the screens on the filters themselves. As far as long term: If they have the means to do it, removing the lead lines is probably the best way to permanently solve that problem. Brackett: Replacing all the lead lines is the solution proposed by Flint’s mayor after the poisoning of Flint’s water system. Del Toral estimates that there are 400,000 lead service lines in Chicago with thousands more in the surrounding suburbs. It's up to the homeowner in Chicago and the suburbs to pick up the cost of replacing their lead pipes. And it's not cheap. Michael Kerrigan Michael Kerrigan, F.J. Kerrigan Plumbing: The average cost for a full-service replacement from the city main all the way into the house could be in the neighborhood from $15,000 to $20,000, depending on how much street is involved, how much restoration you have to get involved in on the street and pavement and it drives up the cost. Brackett: And would that be the same cost in the city as here? Kerrigan: Yes, the same cost in any municipality. You’re still involving streets, you’re still involving locating utilities, and you still have to restore those streets and pavements. Brackett: Because of the cost, homeowners rarely replace lead service lines unless there is a leak or they are renovating their homes. On this job in Kenilworth, Kerrigan Plumbers are replacing a lead pipe after a leak. To do that, a tap is made in the main and reconnected to a new copper service line. But in this case the homeowner elected just to replace the portion of lead pipe that leaked. He did not replace the rest of the lead pipe that ran into his home. It's not the decision that third-generation plumbing contractor Michael Kerrigan made for his own home. Kerrigan: I replaced the water service into my own home with a copper pipe because I have small children, so it is a concern. Brackett: Toxicologist and emergency room physician Dr. Jenny Lu treats children with lead poisoning. She says parents should be concerned about the effects of exposing children to lead. Dr. Jenny Lu Dr. Jenny Lu, John H. Stroger, Jr. Hospital of Cook County: For a child with lead poisoning, depending on the exposure – if it’s been a slow, undetected exposure the long-term effects can be devastating, including decreased intelligence, stunted growth other neurobehavioral aspects, cognitive decline; versus lead exposure from high exposure, where you can have quicker effects including delirium, seizures, encephaolopathy and possibly death as well. Brackett: Lauren Raphael was concerned about exposing her two young daughters to lead when the family renovated their 126-year-old home in Hyde Park five years ago. Lauren Raphael: The inspector had told us that we had all lead plumbing, so I knew that right away when we moved in. Brackett: Raphael made the decision to replace all the lead pipes with copper at a cost of about $10,000. She also made sure her daughters were tested for lead exposure. Lauren Raphael Raphael: They had their normal lead testing and then when we did the renovation I specifically asked the pediatrician about it, and so I had them tested at the end of the renovation to make sure their lead levels were fine and they were. Brackett: Powers says there is no way Chicago will become the next Flint and he stands firmly behind the quality of Chicago's water. Powers: I believe that we are doing enough to ensure that we have the best water quality that we can provide to our customers. Brackett: But after Flint, the professionals who deal with water quality problems every day see things differently. Kerrigan: If the municipalities aren't putting in the proper anti-corrosive chemicals then you're going to get situations like Flint. So it's highly advisable to get rid of as much lead pipe as you can. Del Toral: The best thing to do is to get them out. I think there's a pretty good consensus on that if we could find a way to do that it would be best. Brackett: The Chicago area is hardly alone in confronting the problem of lead pipes. There are millions of them all across America, and since Flint, they're getting a lot more attention. For “Chicago Tonight,” I'm Elizabeth Brackett. Chicago only tests for lead in the water every three years, and then only 50 homes are tested. The city is correct when it says that's all the EPA requires and that Chicago meets all EPA standards for lead in water. But after Del Toral's study found more lead in the water than previously reported, the EPA is urging more testing. So far the city says it will only do what is required by federal standards. 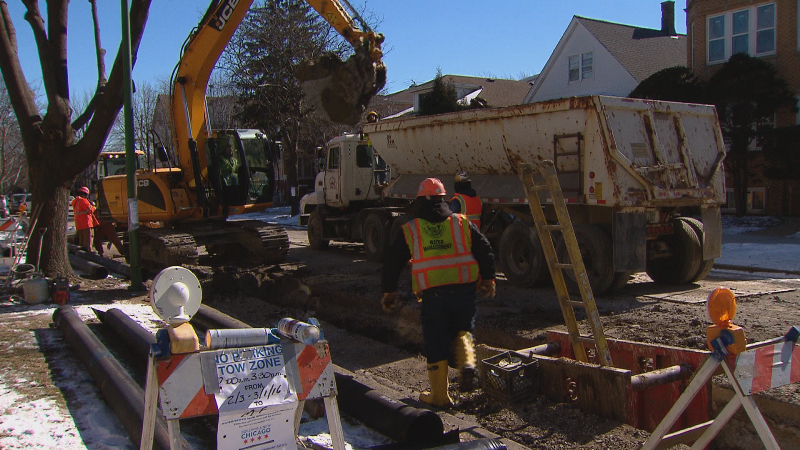 Just yesterday, a group of Chicago residents filed a class-action lawsuit claiming the city knowingly started construction projects that would increase the risk of lead contamination. The city responded by saying though they had not reviewed the lawsuit the city provides the cleanest, best-tasting water possible. Feb. 2: Michigan Gov. Rick Synder is facing calls to resign over his administration's bungled handling of the contaminated water crisis in Flint. A former high-ranking official at the Environmental Protection Agency tells us what she thinks went wrong.